The oldest rugs were made by using the natural coloring of the wool. The range of colours was rather wide. Handmade Rugs with the natural wool coloring are to be found nowadays as well. The high artistic value they have is due to its harmony of subdued colour values. Yarn dyeing is one of the most important stages in rug manufacture. Dyes should be stable, weather and wash protective otherwise colours will become achromatic. The quality of dyeing, the right selection and harmony of colours are pretty much the main indicators for rugs’ esthetic value. The basic method of yarn dyeing consists in boiling away the wool in a dye’s water solution in a specially adapted dyer’s tank. The wool can be dyed as a raw material /washed only/ or as a wool yarn. Various natural dyes are used for colouring: plant, animal and mineral. The plant dyes are extracted from herbs, flowers, vegetables, fruit, trees and at that, only from certain parts /roots, rind, twigs, leaves, blossoms, seeds, fruit /. The obtained hues can be described as soft and deep and in their duration of use, they become even more attractive due to the natural patination. They are extremely durable, suitable for dry-cleaning without loosing their richness. 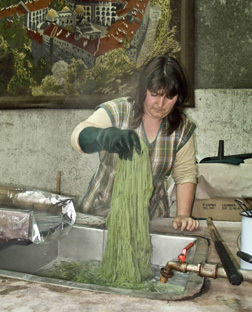 The natural dyeing is a long and arduous process, requiring long experience and mastery. The process consists of three main stages: dye extracting, wool dyeing and colour fixing where the main methods for processing the materials are retting and boiling. Getting a particular colour and its saturation depend on many factors: climatic conditions of the relevant year, at which stage of the plant development the dye material has been collected, the period in which the pigment is strongest, time and temperature of extracting the dye and the wool dyeing process, the colour of the wool, the preparation of the wool for dyeing etc. The red colour is a mixture of Madder root (Rubia tinctorum), Logwood (Haematoxylon campechianum), Poke root (Phytolacca decandra), Hawthorn rinds /Crateagus/. Green colour – Walnut leaves(Juglans regia), Mulberry (Morus), Stinging nettle (Urtica dioica), Periwinkle twigs (Vinca). Blue colour - Indigo (Indigofera tinctoria, Indigofera suffruticosa), Blossoms of cornflower (Centaurea cyanus). Brown colour - walnut pods infusion, green leaves and nutshells(Juglans Regia), Hawthorn (Crateagus), Oak roots /Quercus cerris/, rinds of alder tree (Alnus glutinosa). Grey colour - dry beans (Phaseolus vulgaris), rinds of Alder tree (Alnus glutinosa), Ash tree (Fraxinus excelsior) etc. Pink colour - blossoms of Pelagorium (Pelargonium roseum), green stone (FeSO4), blossoms of Corn poppy ( Papaver rhoeas), twigs of prune (Prunus domestica) etc. Yellow colour – Milkweed (Euphobria ciparissias), vinegar, crab-apple (Pirus malus), Sumac rinds (Rhus cotinus) etc. Black colour - Sumac (Rhus cotinus) and green stone (FeSO4), walnut rinds (Juglans regia), Ash tree (Fraxinus excelsior) etc. The most popular dyes for domestic use, among the ones with animal origin, are Cochineal (carmine) and Sepia. The mineral dyes are extracted from the soil. For the purpose of dyeing textile fabrics, the people have adopted some other substances like slaked lime, soot, ash etc. In the last century, the chemical dyes were brought into use on a large scale. They are easy to use, less expensive, the process of dyeing is shorter and the result is guaranteed. The choice of colour scales is wide and hues are variegated. Generally, the colours are sharper, strong and saturated. The using of chemical dyes changes the pattern of the handmade rugs, making them more motley and vivid, while the natural dyes provide true to life harmony and softness of colours. The real craftsmanship though, is achieving these soft pastel colours and combining them in harmony by using chemical dyes. Nowadays, the commercial conditions increasingly require chemical dye technology in rugs manufacture.